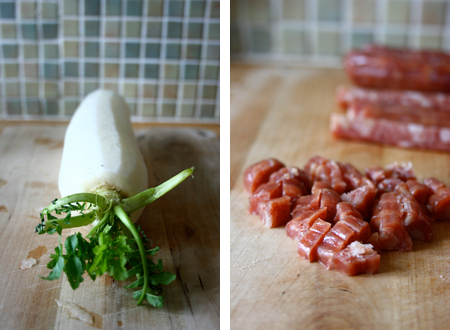 Making Chinese New Year radish cake (蘿蔔糕) | tasty treats! Last year I was lucky enough to be able to head back home to Hong Kong to celebrate CNY, but this year not so much. So in the past few weeks I’ve been trying to cast my mind back to 2008 when my mom taught me step by step how to make radish cake at home. Of course, I called a few days before and grilled her on the various steps, since I didn’t note down any quantities last time around! Her tips were to make sure your radish:rice flour ratio is high (minimum 4:1, though according to my calculations the ratio we used at home is more like 7:1); that you don’t add too much water when you cook the grated radish (as the veg will release enough of its own juices when cooking) and to sift the rice flour well to avoid lumps. The vital ingredients are simple. With the ingredients I had, I made about 4 containers worth of radish cake paste, which makes a LOT – it would probably feed a family of four for at least a few days. To cook the radish cake, I use those simple aluminium foil loaf tins. You’ll also need two fresh, long white radishes, rice flour, 4-5 sticks of Chinese laap cheung (wind-dried sausage), 8 shiitake mushrooms and a small handful of dried shrimps. And we keep the seasonings simple with a small amount of salt and white pepper. Step 1: peel and grate your radishes. This is the most physically exerting bit – my upper arms ache a bit the day after (er, which is probably a sign of how little exercise I’ve been getting lately…). I weighed all the grated radish afterwards so I could work out the ratio of flour I should be using. My two large radishes came to about 1.6kg’s worth. ANYWAYS, so make sure you don’t have too much rice flour. 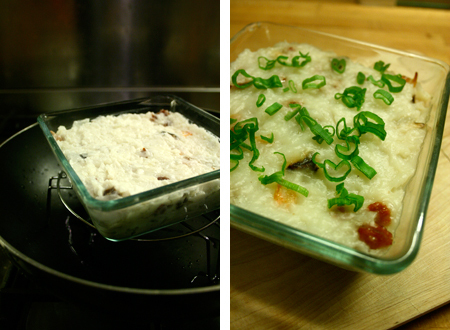 You can always add more if your mixture is too soft, but it will be hard to rectify a stiff radish cake! Step 2: chop up your sausages and shiitake mushrooms (soaked beforehand, naturally. Reserve the soaking liquid for later!) so that they’re quite small. Wash and drain your dried shrimp. Heat a large pan and add the sausages (don’t add any oil) and fry for several minutes over a medium low heat until the fat in the sausages has rendered out. 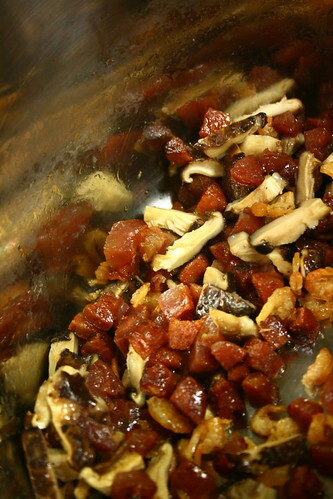 Then add the mushrooms and then the dried shrimp. Fry lightly until fragrant but don’t allow them to brown. Transfer the mixture to a bowl (keeping most of the oil in the pan) and set aside. Step 3: tip your grated radish into the pan, along with about a small cup of the water used to soak the shiitake mushrooms, and cook for about 10-15 minutes, stirring occassionally, until softened. 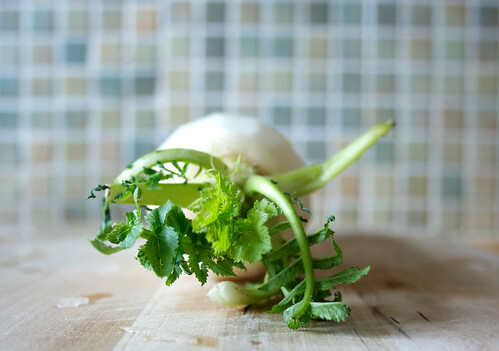 Make sure your radish isn’t swimming in liquid, but are comfortably moist. Season to taste with salt (not too much as the sausages and shrimp are quite salty already) and white pepper. Turn off the heat. Step 4: measure out your rice flour, then sieve it. Add small quantities of the flour into the pan with the radish, stirring well to incorporate it before adding more. You want a mixture that isn’t too stiff, but not too watery either. It should be relatively loose and have a dropping consistency. Then, stir in your goodies – the sausage, mushrooms and shrimps from earlier! Step 5: pour the mixture into your containers of choice (they should be heatproof). Set up your steamer. I didn’t have one large enough, so improvised with a wok, a steam rack, and another wok to act as the lid… haha. Set your radish cakes into the steamer (don’t let it touch the water) and steam for about 45 minutes to an hour. My mom says the water should be bubbling, not simmering. So keep an eye on the water level and top up with hot water often. When ready, a skewer (or chopstick ;D) inserted into the middle should come out clean. At this point we take it out to cool, and we like to add a sprinkling of chopped spring onions and a drizzle of sesame oil. You can eat the cake now as is, but I much prefer radish cake pan-fried… (If you’re not eating immediately, allow to cool completely then put into the fridge. It’ll last about 3-4 days). Every family’s recipe is different, so you don’t have to take this as gospel. I have to say, my first attempt came out pretty decently, but I’m still a bit miffed with my messing up the radish:flour ratio as I like my radish cake a bit less firm (the crisp exterior/melting interior is king!). But essentially the recipe works. If you have any tips to add, please do! Entry filed under: chinese, chinese new year, homemade, recipe. Lizzie – I demand you make it, for your own good! 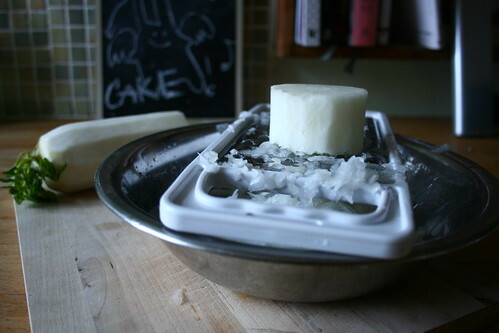 ;-D A bain-marie would probably work I think… post the results if you do try it! These pictures are really beautiful. Thanks so much for this great recipe I can’t wait to try it out and working 5 minutes from Chinatown, I will make that this week. I found a link to your blog through World Foodie Guide and recognised your name straight away, as many of your TO reviews shape my eating, and empty my wallet for that matter. hahahaha… Ive always thought it was have fish every year… are you telling me it isnt?!! that is how bad my chinese is …. either that or my mum just lied to me when i was a kid to make me eat fish! That looks so good. I’d love to make that and try it! Kang – HAHA! no you’re absolutely right – see, it’s a Chinese pun… the ‘yu’ has a double meaning ;-) have fish every year = have an abundant year. 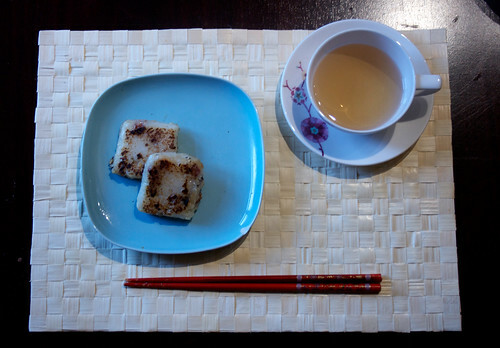 ogz – you’re welcome, I hope it’s helpful if you’re planning to make radish cake! 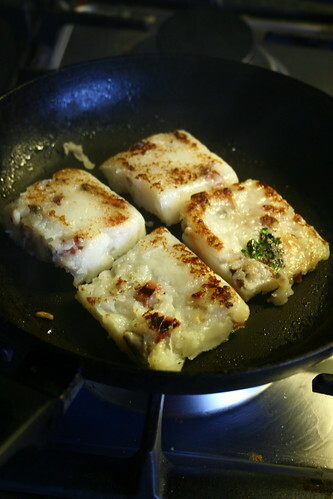 Thank you for sharing the recipe, I love radish cake, yummmmm, I will try to make some radish cake over the weekends…..
One of my friend is craving for Chinese New Year Cake (Lin Go), I’ve tried to buy some for her over the Asian groceries, but they don’t have it, I would like to know if you have the recipe? Thanks! this is one of our favourite dim sum dishes, so i tried to make it today. i used the 9:1 idea, but it never set, so i had to throw it out :( from other recipes, it seems like 3:1 is a better idea. Was looking at your recipe, the ratio of radish to rice flour. 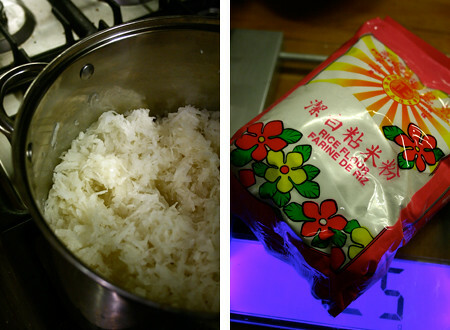 4: 1 means 4 radish to 1 cup of rice flour? How big the radish? In grams? Thanks for this recipe! My radish cake turned out to be a bit too runny even after steaming for a very very long time…what can I do with it? I’d really love to be a part of online community where I can get feed-back from other experienced individuals that share the same interest. If you have any suggestions, please let me know. Appreciate it! Just tried this! So yummy. here within the publish, we need work out more strategies on this regard, thank you for sharing. of this piece of writing, in my view its genuinely awesome for me.